Some years ago, I went for lunch with an old friend who worked (and still works) for Microsoft. At the time, by way of introductions, he gave me one of his latest business cards. 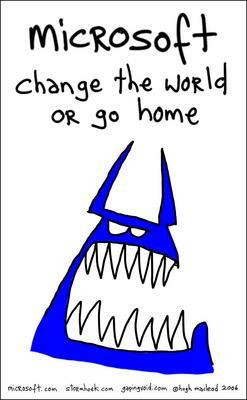 On it was written, ‘Change the world or go home‘. Holding that one business card in my hand signified my first encounter with the ‘Blue Monster’, a life changing event that I would remember always. Why? Because at that moment, I fell in love with an idea. Truly, madly, deeply. The kind of love you find in ‘Beauty and the Beast’. The kind of love so powerful that begins its life as a children’s story, before becoming a Disney cartoon and then finally transforming into a Broadway musical created to move the world. I was still clutching onto the business card when I got home because I wanted to share it with my friend TJ (Thoughtful Jim). “So what do you think?” I remember asking eagerly, hoping that he would join me in the noble and worthy cause of ‘changing the world or go home’. Since resigning wasn’t an option for either of us (we both needed to work to pay the bills), I reasoned that the only option was to change the world through the work we do. As usual, there was a long pause between telling or showing TJ something and getting a response. That fateful day, TJ and I came to a mutual and silent agreement that we would each of us make of the Blue Monster what we will. And to this day, the Blue Monster still has a special place in my heart. Over the years, the Blue Monster has even acquired a special place in our world. I know this because of the continued resonance of his creator’s subsequent work, judging by the way books like ‘Ignore Everybody’ and ‘Evil Plans’ have become successes. Thanks to Hugh McLeod sharing his thoughts on how we should ‘Ignore Everybody’ and have ‘Evil Plans’, I’ve learned to let out a caricature chuckle “Mu-HA-HA-HA!! !” in my head whenever I’ve pushed the Envelope of Assumptions just that bit further and nudged the Wall of Fear of Change by a micro-inch. We can each of us make a difference, no matter how small or how insignificant it may seem to others, so long it matters to us. Just as I choose my restaurants by voting with my feet, I choose to support and sponsor the people who inspire me with their beliefs and actions. Why? So that together, we can shape the future we want to be part of. A future for our children to be part of. Look around you. Who do you support and what does that mean for our future? The entry 'Beauty and the Beast' was posted on July 9th, 2012 at 10:48 am	and last modified on July 10th, 2012 at 4:43 am, and is filed under Courage, Esoteric Minutiae, Leadership. You can follow any responses to this entry through the RSS 2.0 feed. You can leave a response, or trackback from your own site.